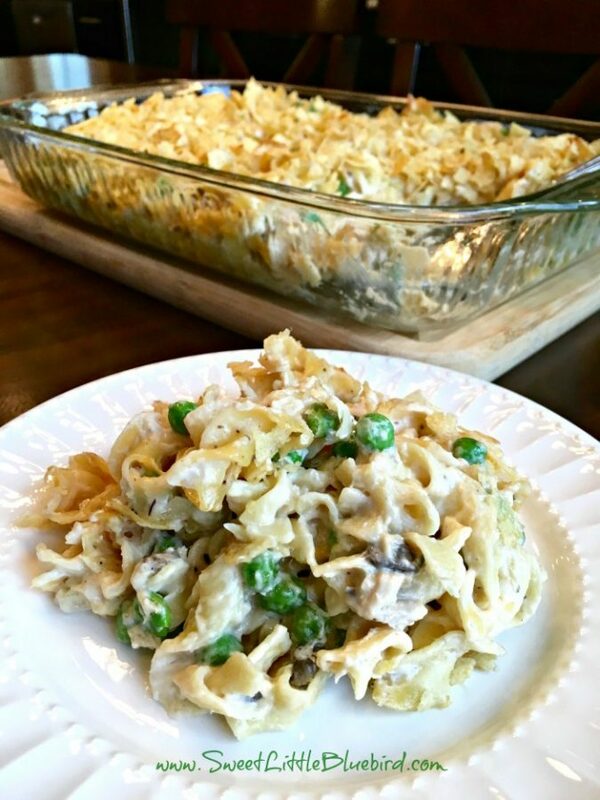 Today I am sharing an old school classic and family favorite – Old Fashioned Tuna Noodle Casserole! Comfort food at its best! OLD FASHIONED TUNA NOODLE CASSEROLE (The BEST recipe – read the RAVE REVIEWS) – Egg noddles in a delicious creamy mushroom soup sauce tossed with tuna, sauteed onions, peas and cheddar cheese, topped with crushed potato chips then baked to perfection…just like grandma used make. Old school comfort food at its best. 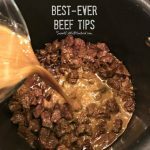 Read rave reviews from people who tried this recipe on Pinterest! 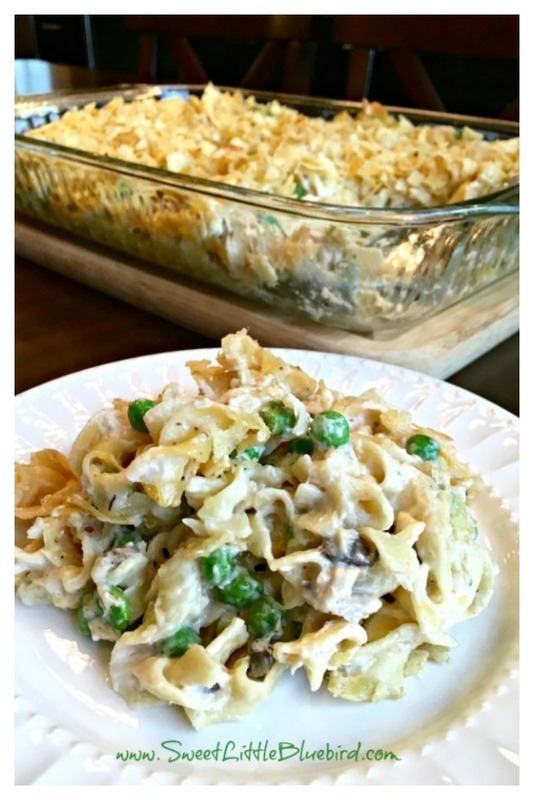 This is the BEST tuna casserole recipe! 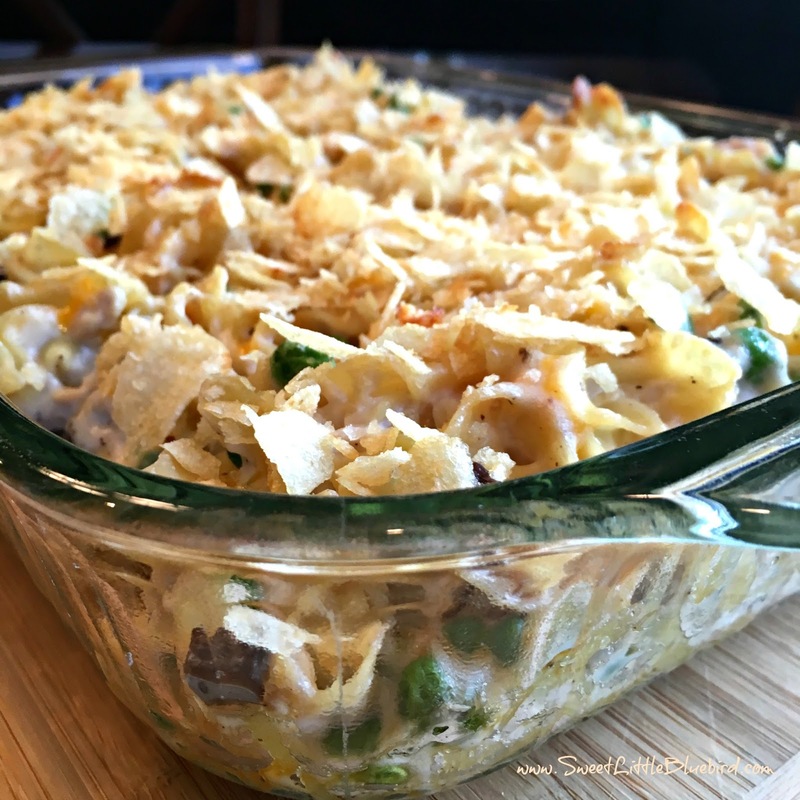 If you were a kid growing up in the 70s and 80s, there’s a good chance this casserole was served often at the dinner table – it was a staple in our home. This recipe was passed down from my grandma and has changed a smidgen over the years but still remains a classic. Old school comfort food at its best! Simple to make, so good. 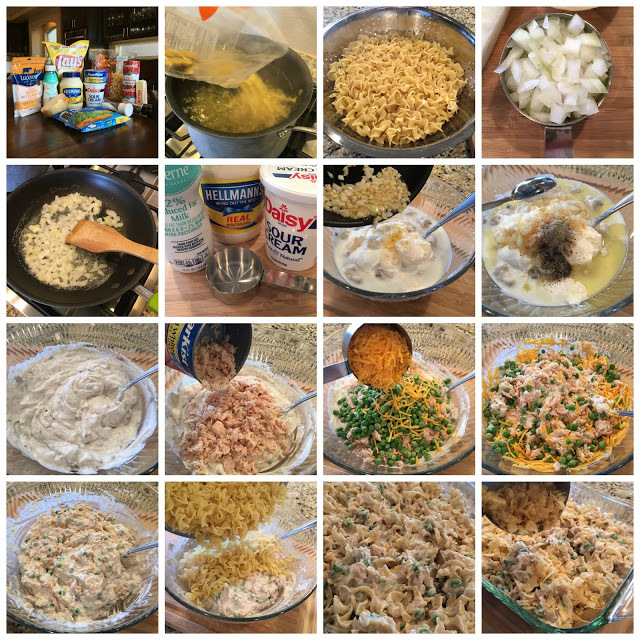 Egg noodles, cream of mushroom soup, mayonnaise, sour cream, milk, solid white albacore tuna, yellow onion, butter, peas, cheddar cheese, salt, pepper and potato chips. Preheat oven to 350 degrees F. Spray a 9×13 baking dish with non-stick cooking spray. Prepare egg noodles, making sure to slightly under cook them by 2 minutes so they are slightly firm. Drain well. In a skillet over medium to medium-high heat melt butter and add onions. Cook until onions are tender and translucent. In a large bowl add cream of mushroom soup, mayonnaise, sour cream, milk, salt, pepper, and the cooked onions and butter from skillet. Mix well. Next, add tuna, peas, cheddar cheese and mix well. Last, add prepared egg noodles, gently folding into soup/tuna mixture until well blended. Pour mixture into casserole dish. Top evenly with potato chips. Place casserole on middle rack of oven and bake for approximately 30 minutes uncovered, until casserole is completely heated through. Enjoy! 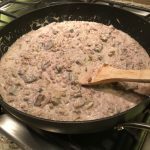 In a large bowl add cream of mushroom soup, mayonnaise, sour cream, milk, salt, pepper, and the cooked onions and butter from skillet. Mix well. Next, add tuna, peas, cheddar cheese and mix well. Last, add prepared egg noodles, gently folding into soup/tuna mixture until well blended. Pour mixture into casserole dish. 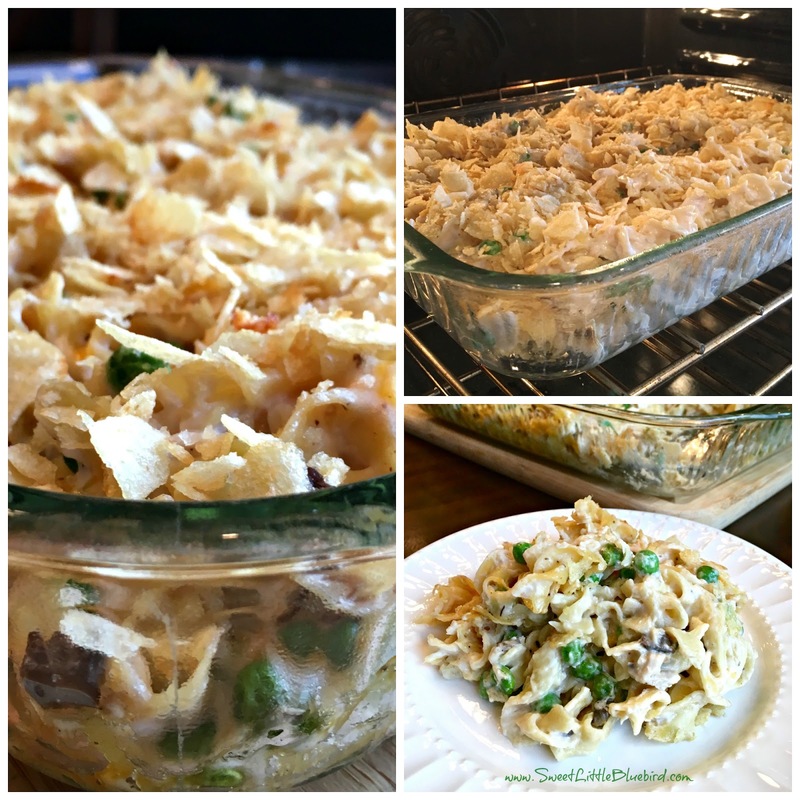 Top evenly with crushed potato chips. I made this for dinner last night as written except replced peas for sauteed celery, I detest peas! When I told my husband I was making it he didn’t sound to excited about it. Well, we both loved it! We finished it off for lunch today and my husband told me I could make it once a week? LoL! Thanks for sharing such a wonderful recipe! Surely to die for. Used to enjoy this but not in a while. Should I even ask about nutrition values? Made this last night and was very surprised how delicious it was ! I have only made the old recipe from the soup can from years ago and thought it was kind of bland. This was very good .I think I may add a little more milk to the mix to loosen it up a little . Excellent ! Can i add corn and diced carrots to this…will it taste right? I did, and it worked well! For the noodles and cheese I use Velveeta Mac and cheese of Shells and cheese it turns out nice and creamy. My family loves this tuna noodle recipe! It’s better than any we’ve had or tried! 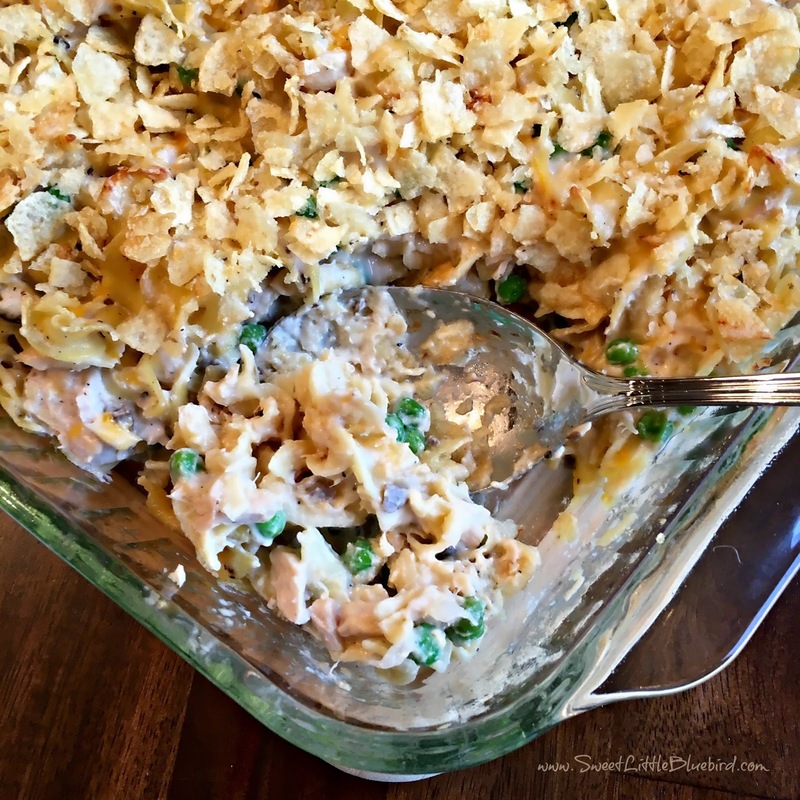 This is now our go-to recipe for tuna casserole. Thank you for publishing it. Just noticed your recipe and was checking out the ingredients. I do make a rich tasting tuna casserole as well. I’ve used cream of chicken or cream of mushroom and softened cream cheese instead of mayo. 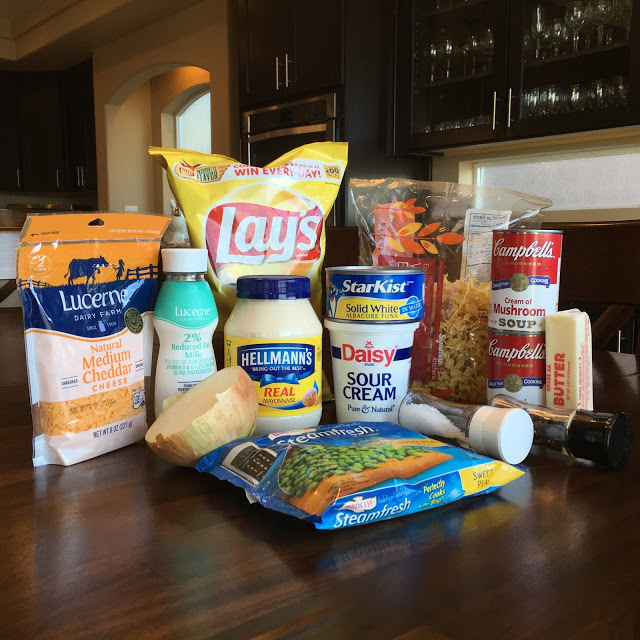 I blend cream cheese, soup, sour cream, tuna in oil pouch (Lg.) lots of sharp cheddar, s&p, garlic powder, dried minced onion, dried parsley poured out into palm of hand and rub to awaken the herb, a bit of half&half or whole milk, taste for seasonings and lastly I use canned Leisure Early Spring Peas 50% less sodium, love the delicate bitty peas that pop when you bite into them. Cook egg noodles in well seasoned water, a minute or two shy of directions, saving a cup of the starchy cooking water to add to the tuna mixture and drain, BUT DO NOT RINSE then blend everything in a large greased casserole dish. Add lots of crushed potato chips on top and bake till bubbly and just when the chips start turning golden but not browned otherwise the chips taste burnt. I also use a hand mixture up till I add the peas. basically like your recipe except the C.C., dried onion, parsley and peas. Also the above mixture will be very creamy and will seem like a lot but will not be dry…..perfect. I really think that you could entirely skip the part about sauteing the onions in butter and dirtying an extra pan just for this. I think you could just add the raw onion and butter to the casserole since it cooks for 30 minutes. The onion should cook during this time. 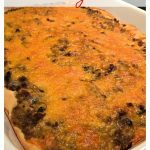 I have a broccoli cheese dip that is made entirely in the microwave and for that you saute the onions in the microwave which would be another way to do it quickly. Use the same casserole that you are making the tuna noodle in but make the first step to saute the onions in butter in the microwave on high for a couple of minutes. Just a thought to save washing a pan. I’m making this for dinner tonight. No peas and adding mushrooms. Can’t wait.